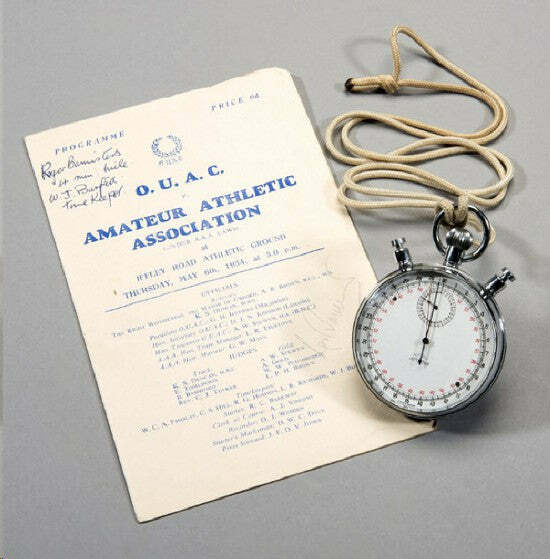 A stopwatch used to time Roger Bannister during his record-breaking four-minute mile is to cross the block at Graham Budd Auctions. It's expected to make around ?�5,000-8,000 ($7,619-12,191) on May 18. Bannister broke the four-minute barrier at Oxford University's Iffley Road Track in 1954. The record stood for just over a month before being beaten the Australian runner John Landy. WJ Burfitt, one of the timekeepers at the event, used the Nero Lemania timepiece. It's sold alongside his own copy of the program for the event, which bears Bannister's signature. "Goodness knows when the next opportunity will come, if at all, to acquire another of the watches that was used on the day, hence the estimate of ?�5,000 to ?�8,000 which is what we're expecting." Another of the watches (there were five) used by chief timekeeper Charles Hill sold for ?�8,855 ($13,493) at Bonhams London in 1998. Please sign up to our free newsletter to receive exciting news about sporting memorabilia auctions.